Following the huge success of the iBooster for iPhone, Wilson Electronics have released two similar products – one to fit the BlackBerry Curve, and a universal unit to fit all cell phones. Like the iBooster, both of these units have cradles which hold your cell phone, boosting signal while you use a hands-free kit or Bluetooth device. With a close connection to the cell phone, both the C-Booster and U-Booster improve signal greatly. 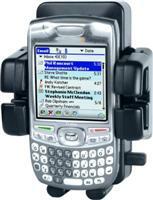 The Wilson C-Booster for BlackBerry Curve (805206) is designed specifically to boost signal for the BlackBerry Curve. The cradle fits the BlackBerry Curve perfectly, boosting signal whilst charging your phone. The C-Booster features the same award winning technology as the iBooster. A powerful 40dB of gain helps users reduce dropped calls, increase data rates, and place calls from “dead spots”. The Wilson Universal Booster (805221) is designed to fit all other phones. The cradle can be adjusted to fit all cell phones. The U-Booster also features the same award winning technology as the iBooster and C-Booster. A powerful 40dB of gain helps users reduce dropped calls, increase data rates, and place calls from “dead spots”. Available December 2009. Pre-order Now! If you have any questions on either the C-Booster or the U-Booster, then please check out the product pages, or contact us.